It's Muffin Tin Monday again, complete with themes restarting this week! After last week's *highly* creative theme of "orange", I was very very grateful for some direction from Michelle (aka MuffinTinMom and my very cool Twitter friend). We opted for a mostly breakfast themed tin for the alphabet theme. Check out Muffin Tin Monday for more fun tins! How cute! Food and learning combined! Counting the days till we can meet "in real life", my friend. Awesome job. 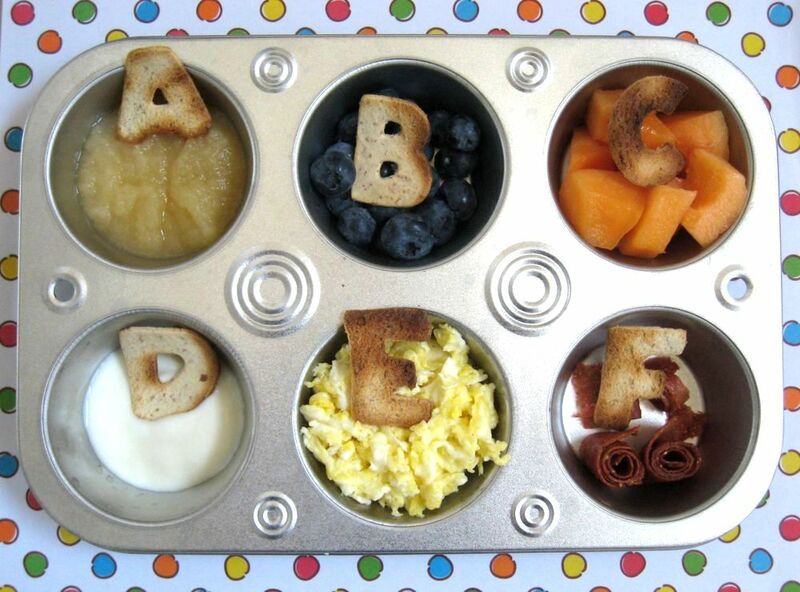 LOVE the toasted letters and breakfast themes are so fun! I did breakfast too. Your letters add a great touch. I love this! Super cute. Looks delicious!! I wish I had been motivated enough to make a tin this morning but it was the first day of school. I love the little letters to go with the foods! That is a good idea - forget the kids - I'll have it myself. Do you have a recipe for the roll-up? It's something we can't get here in the Netherlands. @Alison I used about 10 really ripe strawberries, pureed in my mini processor. I mixed that with organic applesauce (I was going to make my own, but the store had just organic apples with nothing else added but water, so I saved a step there), and a splash of vanilla extract. It goes on a special tray in the dehydrator so that it is spread out thinly, then just dehydrate at 140ish for about 8 hours. Hmmm, I may be able to do that in my pizza oven... Worth a (sticky?) try! Thanks for answering! @Alison, let me email someone for you. I still keep in touch with my old Girl Scout leader and she insists we made them in a real oven. :o) My guess is that as long as you can get them off the surface (I rubbed the tray down with a few dots of canola oil) and you use a low temperature oven, it should work.